Carpentry :: Kellington Construction, Inc.
Kellington's skilled carpentry crew is second to none. Our carpenters take pride in their work and are expert craftsmen paying attention to every detail. No matter the project, safety and quality come first. 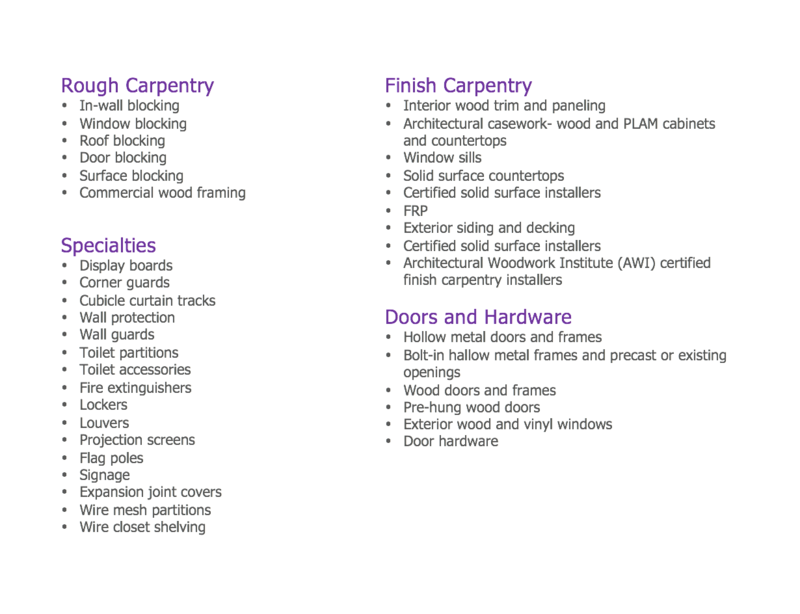 Kellington's union carpenters are well trained and experienced in commercial wood framing, rough carpentry, unique and high end finish trim work, architectural casework, doors and hardware, and building accessories. Our team of skilled estimators, project managers and project superintendents will work with the client's schedules and requests to exceed expectations. Our talented workforce can operate in various conditions, time frames, and adapt to enforce Kellington's focus on quality, service, and results. "We greatly value our partnership with Kellington, their professionalism, follow through and dedication have always supported our project goals. We know we can count on Kellington to get the job done correctly and with care all the time."